The War of the Pacific, also called the Saltpeter War in reference to its original cause, was fought between Chile and the joint forces of Bolivia and Peru, from 1879 to 1883. Chile gained substantial mineral-rich territory in the conflict, annexing both the Peruvian province of Tarapacá and the Bolivian province of Litoral, leaving Bolivia as a landlocked country. For Bolivians, the loss of the territory which they refer to as the litoral (Spanish for "littoral," the coast) remains a deeply emotional issue and a practical one, as was particularly evident during the internal natural gas riots of 2004. Popular belief attributes much of the country's problems to its landlocked condition; conversely, recovering the seacoast is seen as the solution to most of these. However, the real issue is the fear of being too dependent on Chile or Peru. Chile fared better, gaining a lucrative territory with major sources of income, including nitrates, saltpeter, and copper. The national treasury grew by 900 percent between 1879 and 1902, due to the taxes coming from the newly acquired Bolivian and Peruvian lands. The division of the world into what are often arbitrary nation states means that resources are unevenly distributed. Until the ideal of a world government is achieved, economic disparity and unequal access to resources, including the sea, will continue to advantage some to the disadvantage of others. The War of the Pacific grew out of a dispute between Chile and Bolivia over control of a part of the Atacama desert that lies between the 23rd and 26th parallels on the Pacific coast. The territory contained valuable mineral resources which were exploited by Chilean companies and British interests. The Bolivian government decided to increase taxes to take advantage of the increasing income of the region, which led to a commercial dispute. Since the border treaty of 1874 did not allow such increase, the companies felt the tax was unfair and demanded the Chilean government intervene. This eventually led to the diplomatic crisis and war which revealed Peru's secret alliance with Bolivia. The dry climate of the area had permitted the accumulation and preservation of huge quantities of high-quality nitrate deposits—guano and saltpeter—over thousands of years. The discovery, during the 1840s, of their use as fertilizer and as a key ingredient in explosives made the area strategically valuable; Bolivia, Chile and Peru had suddenly found themselves sitting on the largest reserves of a resource that the world needed for economic and military expansion. Not long after this discovery, world powers were directly or indirectly vying for control of the area's resources. The U.S. had passed legislation in 1856, enabling its citizens to take possession of unoccupied islands containing guano. Spain had seized Peruvian territory, but was repulsed by Peru and Chile, fighting as allies during the Chincha Islands War. Heavy British capital investment drove development through the area, although Peru later nationalized guano exploitation during the 1870s. In any case, an unresolved border issue would come to the forefront in the next few decades. Bolivian and Chilean historians disagree on whether the territory of Charcas, originally part of the Viceroyalty of Peru, later of the Viceroyalty of the Río de la Plata and ultimately of Bolivia, included access to the sea. Supporting their claims with different documents, Bolivians claim that it did, while Chileans disagree. When Simón Bolívar established Bolivia as a nation, he claimed access to the sea, although most economic exploitation of the coastal region was being conducted by Chilean companies and British interests. National borders in the region had not been clearly agreed until 1866; the two countries had negotiated a treaty that established the 24th parallel as their boundary, and entitled Bolivia and Chile to share in tax revenue on mineral exports out of the territory between the 23rd and 25th parallels. A second treaty in 1874, superseded this, entitling Bolivia to collect full tax revenue between the 23rd and 24th parallels, but fixed tax rates on Chilean companies for 25 years. 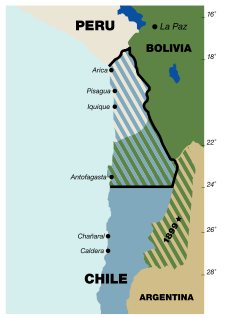 Bolivia subsequently became dissatisfied at the arrangement, as Chilean interests backed by British capital quickly expanded and controlled the mining industry, and feared Chilean encroachment on its coastal region. In 1878, the Bolivian government of President Hilarión Daza decreed a backdated 1874 tax increase on Chilean companies, over protests by the Chilean government of President Aníbal Pinto that the border treaty did not allow such increase. When the Antofagasta Nitrate & Railway Company refused to pay, the Bolivian government threatened to confiscate its property. Chile responded by sending a warship to the area in December 1878. Bolivia announced the seizure and auction of the company for February 14, 1879. Chile, in turn, threatened that such action would render the border treaty null and void. On the day of the auction, 2000 Chilean soldiers arrived, disembarked, and claimed the port city of Antofagasta without a fight. Now facing a territorial issue, Bolivia declared war a week later, and invoked its secret alliance with Peru: The Defensive Treaty of 1873. The Peruvian government was determined to honor its alliance with Bolivia to contain what they perceived as Chile's expansionist ambitions in the region, but was concerned that Allied forces were not in shape to face the Chilean Army; a peaceful resolution was preferred. Peru attempted to mediate by sending a top diplomat to negotiate with the Chilean government. Chile requested neutrality and Peru declined, citing the now public treaty with Bolivia. Chile responded by breaking diplomatic contact and formally declaring war on both Allies on April 5, 1879. Peru thus found itself drawn into the war in spite of not being a party to the original dispute. Argentina was invited to join the Alliance since it had a territorial dispute with Chile regarding the region of Patagonia, and was also wary of Chilean position. Its entry in the war seemed possible and would have provided an advantage to the Allies. Argentina, however, decided to pursue a peaceful settlement to its own separate dispute and resulted in Chile renouncing her ambition over a million square miles of Patagonian territory claimed by Argentina. Bolivia, after several short-lived governments, stood unprepared to face the Chilean Army by itself. From the beginning of the war it became clear that, in a difficult desert war, control of the sea would provide the deciding factor. Bolivia had no navy and Peru faced an economic collapse that left its navy and army without proper training or budget. Most of its warships were old and unable to face battle, leaving only the ironclads Huáscar and Independencia ready. In contrast, Chile—although in the middle of its own economic crisis—was better prepared, counting on its modern navy supplemented by a well-trained and equipped army. The Battle of Topáter, on March 23, 1879, was the first of the war. On their way to occupy Calama, 554 Chilean troops and cavalry were opposed by 135 Bolivian soldiers and civilian residents led by Dr. Ladislao Cabrera, dug in at two destroyed bridges; calls to surrender were rejected before and during the battle. Outnumbered and low on ammunition, most of the Bolivian force withdrew, except for a small group of civilians led by Colonel Eduardo Abaroa, that fought to the end. Further ground battles would not take place until the war at sea was resolved. Under the direction of Rear Admiral Juan Williams, the Chilean Navy and its powerful battleships—Almirante Cochrane and Blanco Encalada—started to operate on the Bolivian and Peruvian coast. The port of Iquique was blockaded, while Huanillos, Mollendo, Pica, and Pisagua were bombarded and port facilities burned. Rear Admiral Williams hoped that, by disrupting commerce and especially saltpeter exports or weapons imports, the Allies' war effort would be weakened and the Peruvian Navy would be forced into a decisive showdown. The smaller, but effective, Peruvian Navy did not oblige. Under the command of Admiral Miguel Grau aboard Huáscar, Peru staged a series of blockade runs and harassment raids deep into Chilean waters. The plan was to disrupt Chilean operations, draw the enemy fleet back to the South while avoiding at all costs a fight against superior forces; as a consequence the Chilean invasion would be delayed, the Allies would be free to supply and reinforce their troops along the coast, and weapons would still flow into Peru from the North. The Naval Battle of Chipana, the first of the war at sea, took place off Huanillos on April 12, 1879, as Peruvian corvettes Unión and Pilcomayo found Chilean corvette Magallanes on its way to Iquique. After a two-hour running artillery duel, Unión suffered engine problems; the pursuit was called off and Magallanes escaped with minor damage. 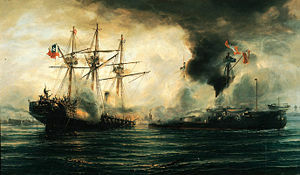 In the Naval Battle of Iquique of May 21, 1879, Peruvian ships Huáscar and Independencia lifted the blockade of Iquique by Esmeralda and Covadonga, two of Chile's oldest wooden vessels. Huáscar sank Esmeralda, while Covadonga forced the larger Independencia to run aground at Punta Gruesa (some historians consider this a different engagement and call it the Battle of Punta Gruesa). The Chilean Navy lost a wooden corvette and elevated Captain Arturo Prat of Esmeralda as a martyr to their cause: He died leading a handful of sailors boarding the ironclad after it had rammed his ship. The Peruvian Navy lost a powerful ironclad frigate and saw Admiral Miguel Grau's renown grow among friend and foe as a result of his actions: He rescued the survivors of Esmeralda after the battle and wrote condolences to the widow of Captain Prat. Significantly, Huáscar remained the only Peruvian vessel capable of holding off the invasion. It took the Chilean Navy a full day of sailing with six ships in order to corner the Húascar, and then, nearly two hours of bloody combat with their vessels Blanco Encalada, Covadonga, and Cochrane to cause her to founder with 76 artillery hits in the Naval Battle of Angamos on October 8, 1879. The dead included Admiral Grau. With the capture of Huáscar, the naval campaign was over. With the exception of local skirmishes, Chile would control the sea for the duration of the war. Having gained control of the sea, the Chilean Army started the invasion of Peru. Bolivia, unable to recover the Litoral province, joined the Peruvian defense of Tarapacá and Tacna. However, many Bolivians would abandon their allies in the heat of the battle, demoralizing both armies. On November 2, 1879, naval bombardment and amphibious assaults were carried out at the small port of Pisagua and the Junín Cove –some 500 km North of Antofagasta. At Pisagua, several landing waves totalling 2,100 troops attacked beach defenses held by 1,160 Allies and took the town; the landing at Junín was smaller and almost unsuccessful. By the end of the day, General Erasmo Escala and a Chilean army of 10,000 were ashore and moving inland, isolating the province of Tarapacá from the rest of Peru and cutting off General Juan Buendía's 1st Southern Army from reinforcements. Marching south towards the city of Iquique with 6,000 troops, the Chilean Army held off a sudden 7,400-strong Allied counterattack at the Battle of San Francisco on November 19, with high casualties to both sides. The Bolivian force with a weak leadership withdrew during the battle, forcing the Peruvian Army to retreat to the city of Tarapacá. Four days later, the Chilean Army captured Iquique with little resistance. Escala sent a detachment of 3,600 soldiers, cavalry, and artillery to wipe out the rest of the Peruvian Army, estimated at fewer than 2,000 poorly trained and demoralized men. 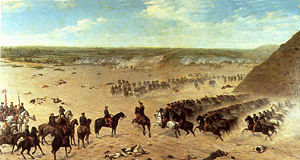 The Battle of Tarapacá, on November 27, took place as the Chilean attack found the Peruvian force in better morale and at almost double the number expected. Led by Colonel Andrés Cáceres, the Peruvian Army routed the Chilean expedition, which left behind significant quantities of supplies and ammunition. The Peruvian victory at Tarapacá would have little impact on the war. General Buendía's army, down to 4,000, retreated further north to Arica by December 18. A new Chilean expedition left Pisagua and on February 24, 1880, disembarked nearly 12,000 soldiers at Pacocha Bay. Commanded by General Manuel Baquedano, this force isolated the provinces of Tacna and Arica destroying any practical hope for reinforcements from Peru. 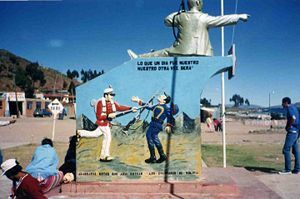 On the outskirts of Tacna, combatants from the three contending countries met on what would later be known as The Battle of El Alto de la Alianza. Commanding the allied army was Narciso Campero, the Bolivian president himself. In the subsequent carnage, Chilean artillery proved superior. As a result, Chile wiped out most of Peru's professional army, after the battle, Bolivia withdrew completely from the war. On June 7, some 4,000 Chilean forces backed by the Navy, successfully attacked a Peruvian garrison in Arica, which was under the command of Colonel Francisco Bolognesi. Chilean forces, directed by Colonel Pedro Lagos, had to run up the Morro de Arica (a steep and tall seaside hill) facing 2,000 Peruvian troops commanded by Colonel Bolognesi. 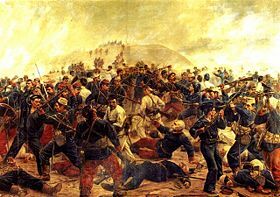 The assault became known as the Battle of Arica, which turned out to be one of the most tragic and at the same time the most emblematic event of the war: Chile suffered 479 mortal casualties, while almost 900 Peruvians lost their lives, including Colonel Bolognesi himself. This battle was especially bloody since most Chileans died because of landmines and with bullets running low most of the Peruvians deaths were in the hands of Corvo-wielding berserked Chileans. The multiple cuts on the corpses made many speculate about execution of prisoners, but most authors say that the Captains were actually holding back the enraged Chileans to prevent the deaths of routed soldiers. Other high ranking Peruvian officers who also perished were Colonel Alfonso Ugarte and Colonel Mariano Bustamante, his Chief of Detail. These Peruvian officers belonged to the group that, on the eve of the battle, had gallantly rejected an offer to surrender the garrison to the Chilean army, and prompted Colonel Bolognesi to vow to the Chilean emissary that he was to defend the garrison to the last shot. Since the Morro de Arica was the last bulwark of defense for the allied troops standing in the city, its occupation by Chile has been of utmost historical relevance for both countries. In October 1880, the United States unsuccessfully mediated in the conflict aboard USS Lackawanna at Arica Bay, attempting to end the war with diplomacy. Representatives from Chile, Peru, and Bolivia met to discuss the territorial disputes, yet both Peru and Bolivia rejected the loss of their territories to Chile and abandoned the conference. By January 1881, the Chilean Army marched towards the Peruvian capital, Lima. Regular Peruvian army and poorly armed citizens set up to defend Lima. However, Peruvian forces were defeated in the battles of San Juan and Miraflores, and the city of Lima fell in January 1881, to the forces of General Baquedano. The southern suburbs of Lima, including the upscale beach area of Chorrillos, were looted. Every civilian was forced to surrender their valuables or suffer a bitter end. This desperate order was issued to raise money to pay the late wages of the soldiers and prevent an uprising. The outlying haciendas were burned down by Chinese coolies, who had been brought in from South China since the early 1850s for cheap labor at the haciendas. With little effective Peruvian central government remaining, Chile pursued an ambitious campaign throughout Peru, especially on the coast and the central Sierra, penetrating as far north as Cajamarca. Even in these circumstances, Chile was not able to completely subjugate Peru. As war booty, Chile confiscated the contents of the Peruvian National Library from Lima and transported thousands of books (including many centuries-old original Spanish, Peruvian, and Colonial volumes) to Santiago de Chile, along with much capital stock. Peruvian resistance continued for three more years, with apparent U.S. encouragement. The leader of the resistance was General Andrés Cáceres (nicknamed the "Warlock of the Andes"), who would later be elected president of Peru. Under his intelligent lead, Peruvian militia forces inflicted painful defeats upon the Chilean army in the battles of Pucara, Marcavalle, and Concepcion. However, after a substantial defeat Battle of Huamachuco, there was little further resistance. Finally, on October 20, 1883, Peru and Chile signed the Treaty of Ancón, by which Tarapacá province was ceded to the victor. On its part, Bolivia was forced to cede Antofagasta. The war theater between 1879 and 1881 was a large expanse of desert, sparsely populated and far removed from major cities or resource centers; it is, however, close to the Pacific Ocean. It was clear from the beginning that control of the sea would be the key to an inevitably difficult desert war: Supply by sea, including water, food, ammunition, horses, fodder and reinforcements, was quicker and easier than marching supplies through the desert or the Bolivian high plateau. While the Chilean Navy started an economic and military blockade of the Allies' ports, Peru took the initiative and utilized its smaller but effective navy as a raiding force. Chile was forced to delay the ground invasion for six months, and to shift its fleet from blockading to hunting Huáscar until she was captured. With the advantage of naval supremacy, Chilean ground strategy focused on mobility: Landing ground forces into enemy territory to raid Allied ground assets; landing in strength to split and drive out defenders; leaving garrisons to guard territory as the war moved north. Peru and Bolivia fought a defensive war: Maneuvering along long, overland distances; relying where possible on land or coastal fortifications with gun batteries and minefields; coastal railways were available to Peru, and telegraph lines provided a direct line to the government in Lima. When retreating, Allied forces made sure that few, if any, assets remained to be used by the enemy. Sea mobile forces proved to be, in the end, an advantage for desert warfare on a long coastline. Defenders found themselves hundreds of kilometers away from home; invading forces were usually a few kilometers away from the sea. The occupation of Peru between 1881 and 1884 was a different story altogether. The war theater was the Peruvian Sierra, where Peruvian resistance had easy access to population, resource, and supply centers further away from the sea; it could carry out a war of attrition indefinitely. The Chilean Army, turned occupation force, was split into small garrisons across the theater and could devote only part of its strength to hunting down rebels without a central authority. After a costly occupation and prolonged anti-insurgency campaign, Chile sought to achieve a political exit strategy. Rifts within Peruvian society provided such an opportunity after the Battle of Huamachuco, and resulted in the peace treaty that ended the occupation and the war. According to Hong Kong Asia Television program, Stories of Chinese Afar III, there were about 2000 Chinese workers participating on the Chilean side. Their roles were spoofing as working with the Peruvians to acquire intelligence, act as back-end support or to initiate a sudden attack to the Peruvian army during Lynch's Expedition. The war saw the use by both sides of new, or recently introduced, military technology, such as breech-loading rifles, remote-controlled land mines, armor-piercing shells, torpedoes, torpedo boats, and purpose-built landing craft. Second-generation ironclads (that is, designed after the Battle of Hampton Roads) were faced in battle for the first time. This was significant for a conflict where a major power was not directly involved, and drew the attention of British, French, and U.S. observers of the time. During the war, Peru developed the Toro Submarino ("Submarine Bull"). Though completely operational, it never saw action, and was scuttled at the end of the war to prevent its capture by the victors. Borders of Chile, Bolivia and Peru before and after the war. Notes: the map doesn't include Tacna that was occupied until 1929 by Chile. 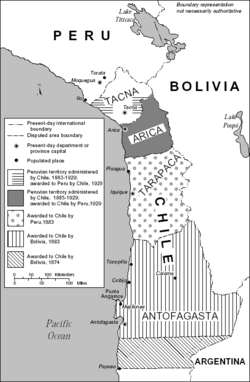 Under the terms of the Treaty of Ancón, Chile was to occupy the provinces of Tacna and Arica for 10 years, after which a plebiscite was to be held to determine their nationality. The two countries failed for decades to agree on the terms of the plebiscite. Finally in 1929, through the mediation of the United States under President Herbert Hoover, an accord was reached by which Chile kept Arica; Peru reacquired Tacna and received $6 million indemnity and other concessions. In 1884, Bolivia signed a truce that gave control to Chile of the entire Bolivian coast, the province of Antofagasta, and its valuable nitrate, copper and other mineral deposits. A treaty, in 1904, made this arrangement permanent. In return, Chile agreed to build a railroad connecting the Bolivian capital of La Paz with the port of Arica and guaranteed freedom of transit for Bolivian commerce through Chilean ports and territory. The War of the Pacific left traumatic scars on Bolivian and Peruvian society. Picture from Bolivia, 1992. It says: "What once was ours, will be ours once again," and "Hold on rotos (chileans), that here come the Colorados of Bolivia"
For Bolivians, the loss of the territory which they refer to as the litoral (Spanish for "littoral," the coast) remains a deeply emotional issue and a practical one, as was particularly evident during the internal natural gas riots of 2004. Popular belief attributes much of the country's problems to its landlocked condition; conversely, recovering the seacoast is seen as the solution to most of these. However, the real issue is the fear of being too dependent on Chile or Peru (both nations are not trusted by Bolivians). In 1932, this was a contributing factor to the Chaco War with Paraguay, over territory controlling access to the Atlantic Ocean through the Paraguay River. In recent decades, all Bolivian Presidents have made it their policy to pressure Chile for sovereign access to the sea. Diplomatic relations with Chile have been severed since 17 March 1978, in spite of considerable commercial ties. Currently, the leading Bolivian newspaper, El Diario still features at least a weekly editorial on the subject. Peruvians developed a cult for the heroic defenders of the patria (nation, literally motherland), such as Admiral Miguel Grau and Colonel Francisco Bolognesi, who were killed in the war, and General Andrés Cáceres, who went on to become a leading political figure and symbol of resistance to the occupying Chilean Army. Peruvian heroes of the war are buried in the "Panteón de los Próceres" in Presbitero Maestro cemetery in Lima, Peru. This mausoleum is the largest in the cemetery, and its entrance reads "La Nación a sus Defensores" (From the nation, to its defenders). The defeat engendered a deep inferiority complex among the ruling classes, which also led to a skewed view of the role of the armed forces, which dominated society throughout the twentieth century. Chile fared better, gaining a lucrative territory with major sources of income, including nitrates, saltpeter and copper. The national treasury grew by 900 percent between 1879 and 1902 due to the taxes coming from the newly acquired Bolivian and Peruvian lands. Victory was, however, a mixed blessing. During the war Chile waived most of its claim over Patagonia in 1881 to ensure Argentina's neutrality; Chilean popular belief sees this as a territorial loss. British involvement and control of the nitrate industry rose significantly after the war, leading them to meddle in Chilean politics and ultimately to back an overthrow of the Chilean President in 1891. High nitrate profits lasted for only a few decades and fell sharply once synthetic nitrates were developed during World War I. This led to a massive economic breakdown, since many factories had closed to free up labor for the now dead extraction business. Currently, the region is still the world's richest source of copper and its ports move trade between nearby countries and the Pacific Ocean. The war consolidated the Chilean Navy as an institution, as the War of Independence and the 1836 War against the Santa Cruz confederation consolidated the Chilean Army. After many years during which it had been considered an irrelevant and unimportant item on Chilean budget, the Chilean Navy gained an important squadron and became a significant power on the Pacific Ocean, with the cruiser Esmeralda, the fastest vessel of its time. A strong class of naval officials also emerged from the war, most of them descendants of immigrants and not related to Santiago's circle of power; this class played a role in the plot against president José Manuel Balmaceda in 1891. The infantry divisions, especially the ones of Atacama, also gained great respect, generating all sort of folk tales of bravery and skill. To this day the Calama division is known and feared for its skill with the Corvo, a close combat crescent moon knife. In 1999, Chile and Peru finally agreed to complete the implementation of the last parts of the Treaty of Lima, providing Peru with a port in Arica. Nevertheless, tensions between Chile and Peru are usually associated with recent arms race in the region. Colonel Alfonso Ugarte †, Bolognesi's top lieutenant, a rich saltpeter entrepreneur and former mayor of Iquique, was killed during the Battle of Arica, believed to have jumped off a cliff on his horse to save the flag from capture. ↑ Wikisource, (Spanish), Tratado de límites de 1866 entre Bolivia y Chile. Retrieved November 7, 2007. ↑ Corporación de Defensa de la Soberanía, (Spanish), Causa y Consecuencias de la Guerra del Pacífico. Retrieved November 7, 2007. ↑ Wikisource, (Spanish) Tratado de Ancón. Retrieved November 7, 2007. ↑ El Diario, (Spanish), Noticias El Diario. Retrieved November 7, 2007. ↑ John B. Foster and Brett Clark, "Ecological Imperialism: The Curse of Capitalism," The Socialist Register (2004): 190-192. ↑ Jorge I. Domínguez, David Mares, Manuel Orozco, David Scott Palmer, Francisco Rojas Aravena, and Andrés Serbin, Boundary Disputes in Latin America (Washington, D.C.: Institute of Peace, 2003). ↑ Alex Sanchez, Council on Hemispheric Affairs. Retrieved November 7, 2007. Corporación de Defensa de la Soberanía. Causa y Consecuencias de la Guerra del Pacífico. Retrieved November 7, 2007. El Diario. Noticias El Diario Retrieved November 7, 2007. Domínguez, Jorge I., David Mares, Manuel Orozco, David Scott Palmer, Francisco Rojas Aravena, and Andrés Serbin. Boundary Disputes in Latin America. Washington, D.C.: Institute of Peace, 2003. Foster, John B., and Brett Clark. "Ecological Imperialism: The Curse of Capitalism." The Socialist Register (2004): 186-201. Sanchez, Alex. The Peru—Chile Arms Race: Current Ramifications of a Bitter History. Council on Hemispheric Affairs. Retrieved November 7, 2007. The United States and the Bolivian Seacoast Online book by Bolivian historian and diplomat Jorge Gumucio Granier. (Spanish) La Guerra del Pacífico, Los Héroes Olvidados Chilean site. (Spanish) Sin mar… hace 127 años ("Without Sea… for 127 years"); page about the war and its impact on Bolivian society. History of "War of the Pacific"
This page was last modified on 18 October 2016, at 14:44.